From city center 1 Km. Restaurant Open for lunch and dinner, serves Ligurian cuisine using only fresh and seasonal ingredients. In 1875 two Scottish noblemen, George Henderson Gibb and General William Montagu Scott McMurdo, were the first British to spend an entire winter in Alassio along with their families. General McMurdo built, designed and constructed the Villa according to the Anglo-Indian principles. When General McMurdo died in Nice in 1894, his family sold the villa to Sir Walter Hamilton-Dalrymple,a Scottish baronet. The Dalrymples maintained ownership of the villa until 1922, when Sir Hew Clifford Hamilton-Dalrymple, 9th baronet, sold the residence to Daniel Hanbury, second child of Sir Thomas Hanbury of Mortola. The Hanbury family clearly gave a major boost to the completion of the Villa's garden, significantly increasing the variety of exotic plants in the park at the Villa. In 1940, at the outbreak of the second world war, the Hanbury family returned to the UK. The widowed Daniel married to his second wife Ruth Hardinge, also from a British family in Alassio. In 1946 the Hanburys returned to Alassio, but Daniel died suddenly in 1948, and left the property to his wife Ruth Hardinge .Ruth returned to live at the Villa and joined a small group of anglo-alassini, guests of her famous spring parties during the flowering of wisteria. In 1925 Alfred Hitchcock filmed scenes from his first film "The Pleasure Garden" on the beach in Alassio and in the park of the Villa and in 1957, the Oscar winning filmmaker Guy Green set "The Snorkel" with Betta St. John, Peter Van Eyck and Mandy Miller in Villa . Author and artist Carlo Levi used the Villa as an annex for his nearby villa in the 1960s and 70s. 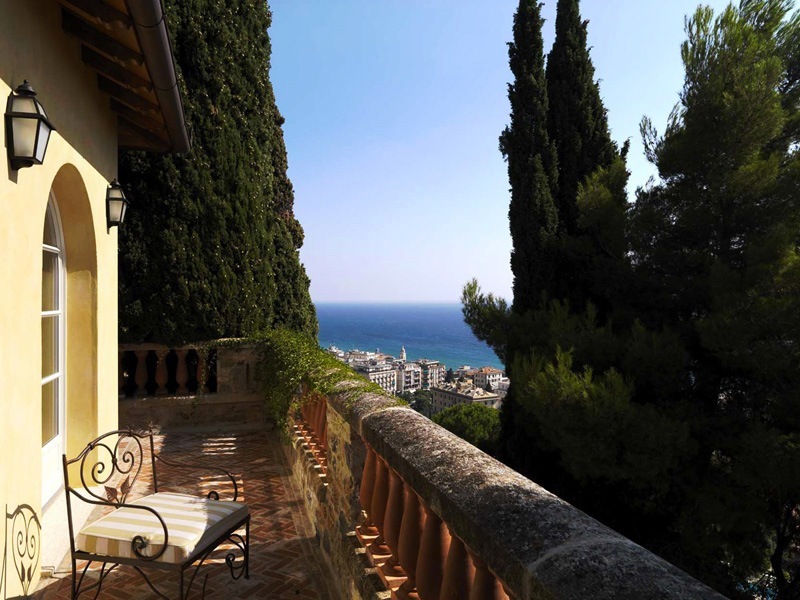 The Description The complex consisting of three elegant buildings, the Villa, the Villino and Casa del Sole. The two refurbished late 19th century villas, faithfully preserved and restored under architect Ettore Mocchetti, authentically replicate the lay out of British residences from the Victorian period in India and Malaysia. Set apart within a corner of the flourishing garden, Casa del Sole, meaning 'house of the sun', owes its name to its special location that floods it with endless natural light. The Description This south-facing suite boasts a private patio from which you can enjoy the most beautiful view of the Bay framed. The 5 suites are dedicated to some figures that have stayed at the Villa on the past, or were part of the British community in the Riviera. Some rooms have patio or terrace with table, chairs and sun lounger and all have private bathroom, air conditioning, small library with books, flat screen LCD tv with satellite channels, sky and films on demand, wifi and wired internet connection, direct line telephone, mini-bar, hairdryer, safe. The Description The Villino has 6 suites, dedicated to the many figures that have stayed at the Villa on the past, or were part of the British community in Riviera. They have the following facilities spacious bathroom with shower and whirlpool bath, air conditioning, small library with books on the Riviera, flat screen LCD tv with satellite channels, sky and films on demand, wifi and wired internet connection, direct line telephone, mini-bar and coffeemaker, kettle, safe. The Description The private, separate Casa del Sole contains a stylish apartment, painstakingly restored and equipped with every comfort. The house was at one time the favourite venue for the ubiquitous afternoon tea and leisurely moments spent by the Dalrymples and then the Hanburys. Extending over two levels with a sitting room with direct access to the garden on the upper floor and sleeping area on the lower floor. It offers separate bedroom and sitting room, two equipped patios, spacious bathroom with shower and turkish bath, air conditioning, flat screen lcd tv with satellite channels, sky and films on demand, wifi and wired internet connection, mini-bar and coffeemaker, safe.